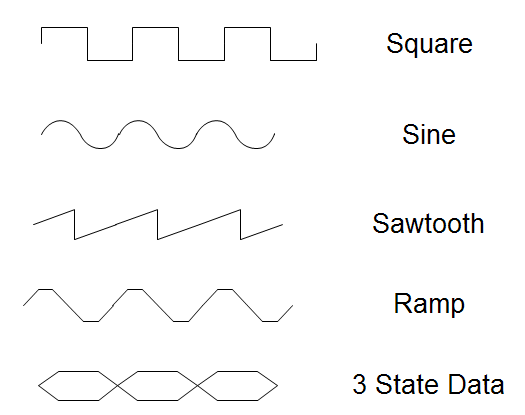 Provides a visual representation of waveform symbols and their proposed use in creating the electrical signal waveform diagram. Waveform is a representation of how alternating current (AC) varies with time. The most familiar AC waveform is the sine wave, which derives its name from the fact that the current or voltage varies with the sine of the elapsed time. 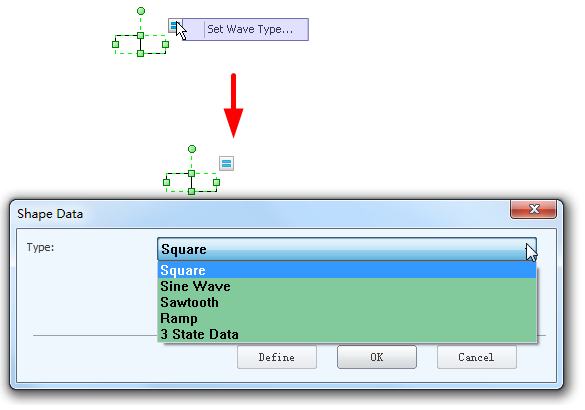 Click the floatng button around the waveform shape, just as the picture below shows to set its property. Currently, we have 5 kinds of waveform shapes which is shown in the following picture, but could be more in the near future. Read electrical symbols introduction to get more information. Need fresh looking waveform symbols for your design? These waveform symbols are a cinch to pop in. And their crisp, fine detail will make spectacular, easy-to-understand diagrams and presentations to your customers.